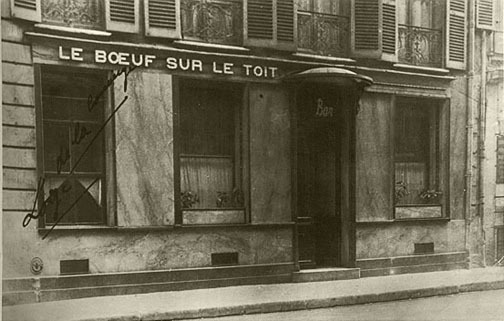 The top two photographs below are exterior shots of the bar-restaurant Le Boeuf sur le Toit in its original location at 28 rue Boissy dAnglas, in the quartier of the Madeleine, Paris. The establishment, which opened officially on 10 January 1922, occupied the two store fronts on either side of the buildings porte cochère until 1928. The hand-written supper menu offered typical elegant dishes of the period, to be consumed in many courses. Starters included oyster cocktail, fresh Russian caviar, and Parma ham. These were followed by soupe à loignon gratinée or cold madrilène. Next, one could savor truffled scrambled eggs, jellied egg, grilled duck, or fried sole. Then came the main courses: entrecôte minute, grilled chicken American style, lamb kidneys Vert Pré, or a lamb chop with green peas. 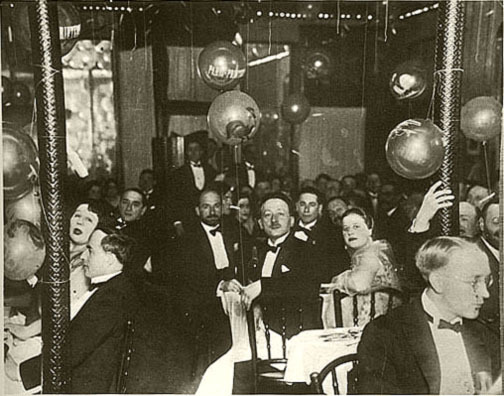 Patrons who had already dined could fortify themselves with a selection of sandwiches, cold plates, a rabbit terrine, or the famous fresh foie gras of Strasbourg. Desserts were rather ordinary: crème caramel, fruit compote, vanilla or strawberry ice cream, and fresh fruit of the season. 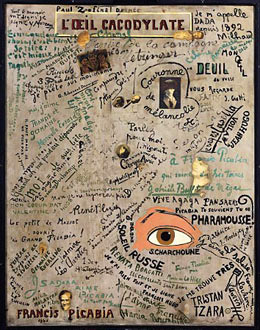 Francis Picabias famous Dada painting LOeil Cacodylate (now at Centre Pompidou) used to hang in the bar of Le Boeuf sur le Toit. It can be seen on the left wall in the photo below. Sitting underneath is the proprietor, Louis Moysès. On the extreme right is the pianist Clément Doucet. 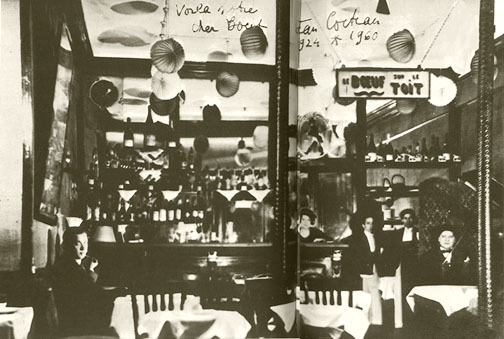 This photo was signed by Jean Cocteau in 1960, with the exclamation Voila notre cher Boeuf. It is said to have been taken by Man Ray, but so are other photos in the Artcurial catalog that were since proven to have been shot by Cocteau (more on this subject in Billy Klüvers book A Day With Picasso: Twenty-Four Photographs by Jean Cocteau). 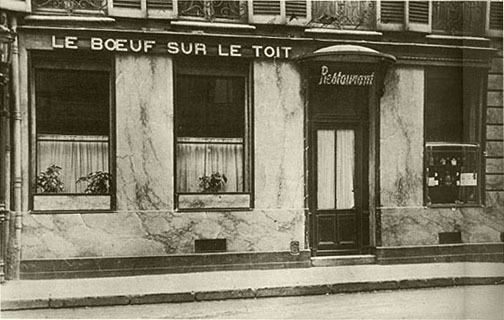 Jean Wiéner was the house pianist at the Gaya bar and later at Le Boeuf sur le Toit. He was succeeded by Clément Doucet. The two pianists were friends and recorded many duets between 1925 and 1937. 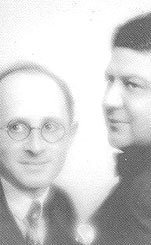 Their recordings have been reissued in the 2-CD collection Les Rarissimes de Jean Wiener & Clément DoucetLes Années Folles (EMI Classics 7243 5 86480 2 7), from which the facing photo was taken. Among the Doucet compositions included in Les Rarissimes is the 1926 tune La Vache dans la Cave, which replaces the ox on the roof with a cow in the cellar. Its worth noting that in 1928, Wiéner and Doucet recorded a maxixe titled Covanduinho (Cavaquinho/N. Milano) and a samba called Vem! Fidoka (A. Guia de Cerhugira). Note: All the photographs marked Henrion collection came from the archive of Louis Henrion, Louis Moysèss nephew. Between May and July 1981, they were on view at the Centre dArt Plastique Contemporain Artcurial, 9 avenue Matignon, Paris, as part of the exhibition Au Temps du Boeuf sur le Toit 19181928, and were printed in the exhibition catalog, from which they were scanned in reduced size.